It's little wonder that your feet begin to sweat and smell when they spend all day constricted by tight shoes. Feet crave fresh air and most shoes don't give them that luxury. You can't always walk around barefoot to ward off sweat, but you can treat your feet right whether they're in or out of shoes. By keeping your feet and shoes clean, you'll help to nix sweaty soles and say goodbye to embarrassing foot odor. Wear a clean pair of cotton socks to prevent most sweating when you wear shoes. Do not wear the same pair of socks more than once. If you have foot odor, consider wearing antibacterial socks. 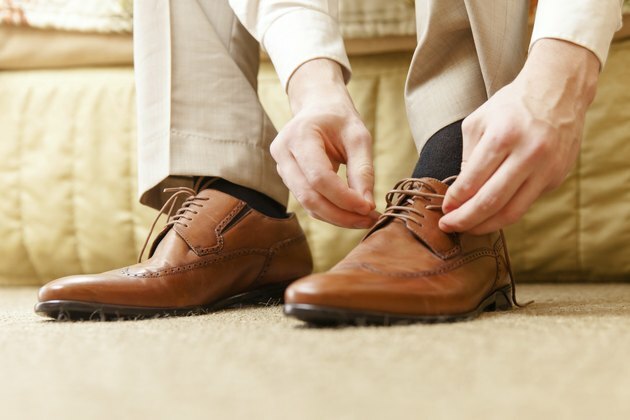 Change the shoes you wear every day. This gives your shoes a chance to dry out. Scrub between your toes and wash the tops and soles of your feet with warm water and antibacterial soap every day. Pat your feet dry with a towel before putting on socks or shoes. Fill a bowl with warm water, then add a few packets of black tea. Give the tea a few minutes to steep, then soak your feet in the mixture for up to 30 minutes. The tannic acid in the tea may help stop feet from sweating. Wear open-toed shoes or sandals to allow air to reach your feet. If your feet aren't confined, they won't sweat as much. Canvas and leather shoes also let your feet breathe. Clean your shoes by hand every few weeks, if possible. Wash sneakers of canvas shoes in hot water with a capful of laundry detergent and color-safe bleach. Don't immerse leather or suede shoes in water. Instead, wipe them clean with a damp washcloth and mild soap. Apply a spray-on antiperspirant to the soles of your feet. Antiperspirant is designed for your underarms, but it works just as well on feet to stop sweating and odor. Put foot powder in your shoes before wearing them. Foot powders contain baking soda and talcum powder to help ward off sweat and odor. Insert cedar trees into your shoes when you're not wearing them. The cedar absorbs wetness and makes shoes smell nicer. Crumpled-up newspaper absorbs moisture, too, if you don't own a cedar tree. If you can't wash your shoes to remove odor, try putting them in a plastic bag and sticking them in the freezer overnight. Freezing kills odor-causing bacteria. If you feel like you're sweating excessively, or if the sweating doesn't stop after treatment, see a doctor for help. Ohio University: Reducing Sweat and Bacteria Growth Key to Treating "Smelly Feet"